Five months after he was mauled by a tiger, illusionist Roy Horn of "Siegfried & Roy" was able to walk again with the help of a wheeled walking aid, a spokeswoman for the duo said Tuesday. Horn, 59, managed to walk 558 paces last week with the assistance of the device, spokeswoman Claudia Dressler said from Munich, adding that he has "strong willpower" and is training intensively. 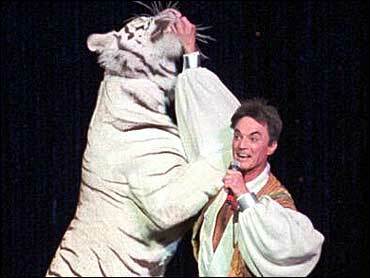 Horn was mauled by a 300-pound white tiger on Oct. 3, during his stage act in Las Vegas. The tiger attacked Horn during a sold-out performance at The Mirage hotel-casino. Horn's partner, German-born magician Siegfried Fischbacher, has downplayed Horn's injuries from the attack, describing the illusionist's wound as "a little punch hole" on the left side of his neck. Fischbacher has said a stroke Horn suffered afterward resulted from blood pressure medication that sometimes made him feel faint. MGM Mirage officials have said Horn has a long recovery ahead of him, and the duo's long-running show has been closed.